Further to last week where I discussed the frustrations of publishing, it is my pleasure to share my interview with another writer taking the independent press route. Please “meet” fellow Chapeltown Books author, Gail Aldwin. Also many thanks to her for supplying the images for this interview. Gail is an award winning short story writer and creative writing tutor. Her flash fiction collection, Paisley Shirt, has recently been published by Chapeltown Books. Gail, like me, has also been published by Cafelit. Gail has travelled around the world on a double decker bus! Now there are bound to be some stories there, I would have thought, so let’s find out more about her writing and that bus trip! What triggered the double decker bus journey? Were you inspired by Cliff Richard’s film Summer Holiday here because it was what I immediately thought of?! Have you used any of your experiences here in your fiction? (I sometimes use things I have direct experience of not “straight into a story” so to speak but I ask how my character would handle it and ensure they would handle it differently from me. I then look at why they’d do that. But direct experiences can be a very useful starting point). When I was twenty, I lived in a bedsit in South Kensington. My route to work took me past a travel agent’s shop where displays of Top Deck buses filled the windows. I was already saving for a trip to Australia to meet a friend and intrigued about buses travelling across deserts and mountains, I made enquiries. The three-month trip cost £500, about the same price as flying, so the choice was simple. I joined the bus in October 1981, slept on one of the bunks upstairs and helped to cook meals in the kitchen downstairs. It was an amazing experience and I’m still in touch with friends I made on the journey. A couple of years ago, one of my fellow travellers and I went to see a Top Deck bus that is now housed in the Bus Museum on the Isle of Wight. It brought back loads of memories of night drives, detours, border crossings and the rest of the shenanigans you might expect on a journey of that sort. Turkey was my favourite county back when the beaches of seaside towns like Silifke and Side were deserted and pine trees edged the sand. The Greco-Roman ruins of Ephesus were magnificent and not at all crowded. 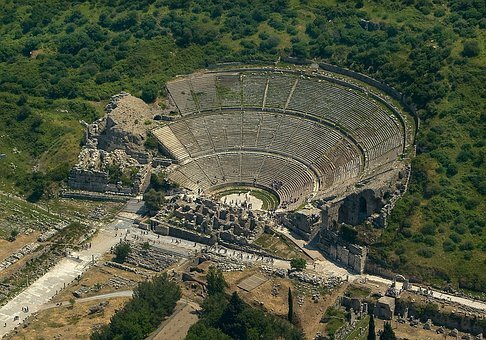 The ruins of an ampitheatre at Ephesus. Image via Pixabay. 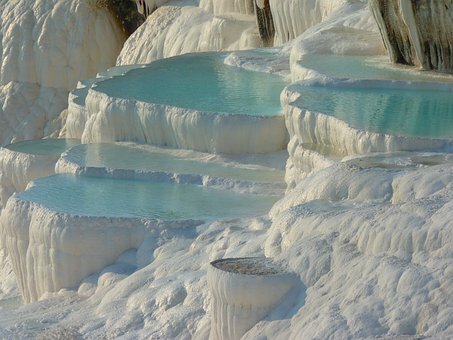 We took a dip in the thermal springs at Pamukkale which would not be permitted today. It was very cold and snowy by the time we attempted the journey from Turkey into Iran. By then we were travelling in a convoy of four buses and had to share two sets of snow chains between all the buses so it was a slippy and scary part of the journey. My short fiction collection is called Paisley Shirt – the title comes from one of the stories in the book. I recently discovered that the design for paisley print started in Kashmir. According to the Textile Glossary, paisley pattern “is a droplet-shaped vegetal motif, similar to half of the T’ai Chi symbol, the Indian bodhi tree leaf, or the mango tree. The design originates in India and spread to Scotland when British soldiers brought home cashmere shawls.” This discovery motivated me to undertake further research. The East India Company began importing shawls from Kashmir and Persia and due to their popularity, production of paisley shawls began in the small town of Paisley in Scotland. By the 1850s six thousand weavers were employed to produce paisley shawls made from wool. Although the pattern produced by these weavers became known as paisley due to the link with the town, this pattern is known as palme in French and bota in Netherlands. I still own possessions that I bought in Kashmir during a detour there in 1981. Although the carpet that now sits in front of our Dorset hearth isn’t really a paisley design, I was interested to learn that an embroidery stitch originally used to decorate rural workers’ smocks has a similar pattern. So from a journey around the globe I find Paisley Shirt brings me back to Dorset via the 1957 publication by Olivia Pass which details the techniques need to create Dorset feather stitch. Many of the stories in Paisley Shirt have won or been placed in competitions. I use competition entries as a way to enforce deadlines on my writing. I usually have a long project that I’m working on such as a novel or a screenplay and it’s good to work on short fiction alongside this to gain a sense of satisfaction in having a piece of work completed. Small successes build confidence for when the inevitable rejections arrive. As a writer, resilience is a professional skill – you need the ability to bounce back and get on with the work. Can’t agree more. Also when you look at a rejected story, it gives you a chance to work at it again and send it out elsewhere. Just because one person didn’t find it suitable, it doesn’t mean that you can’t do something with the tale. One of my first successes as a writer was gaining third place in the short story competition at the Winchester Writers’ Festival in 2011. This was a great boost and I went on to win first place in the slim volume short edition competition the following year. I don’t attend many writing conferences these days, but they provided invaluable support at the beginning of my writing journey. Other notable writing successes include being placed in the Elle Magazine annual writing competition in 2015. My prize was a monogrammed Smythson notebook which is so gorgeous, I still haven’t written in it. When putting my collection of short fiction together, I realised many of the stories had the same theme of resilience. I like to set obstacles for my characters to overcome in order for them to learn and progress. It was a great thrill to discover Chapeltown Books were willing to publish this collection and it feels like I’ve reached a high point in my writing journey having such a beautifully produced collection to my name. Allison: It is funny how often themes emerge unconsciously. In my From Light to Dark and Back Again there are a lot of justice (often poetic) stories but I didn’t set out to write them like that. I realised the theme was emerging as I looked back over my draft. Part 2 of my interview with Gail will share some of her tips for writers and her thoughts on characters. She also discusses her involvement with the Dorset Writers’ Network and shares what she loves about teaching creative writing. Thank you for interviewing me for this post, Allison. It is a pleasure to share my writing journey with readers of Chandler‘s Ford Today. It was great fun to interview you, Gail. The bus journey is a fab story! I have recently discovered Gail’s writing and am really enjoying reading Paisley Shirt. This was an extremely informative interview. Thank you for posting it, Allison. Many thanks, Jim. Part 2 next week shares Gail’s writing tips and her thoughts on “real” books and ebooks amongst other topics. A lot of insights for both writers and readers. An interesting interview, Allison and Gail! Great pics too!